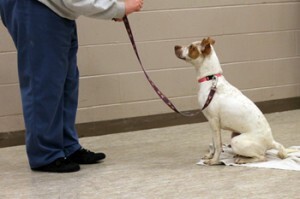 Faith is a smart dog and bonded with her trainer quickly. Here she is giving him serious attention as she waits for her next command. Local nonprofit organization, Paws & Think, recently received a $15,000 grant from the Nina Mason Pulliam Charitable Trust. The Trust seeks to help people in need, especially women, children and families; to protect animals and nature; and to enrich community life in Indianapolis. On June 19th, the Trust announced its first round of 2014 grants, which included more than $1.4 million to 18 Indiana nonprofit organizations. 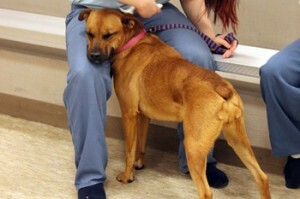 Paws & Think will use the grant for their Youth Canine Program. Started in October of 2013, this 5-day program takes place each month, and involves youth from the Juvenile Detention Center training dogs from Indianapolis Care and Control. This basic obedience training helps increase the likelihood of the dogs being adopted, and so far, all 46 dogs from the program have found a home. Each dog who completes the program receives a certificate on their kennel with their photo, letting potential owners know that they’ve had basic obedience training. Part of the program teaches the importance of general pet care — from brushing your dog’s teeth, to giving them heartworm preventative, to doing full body checks for lumps and bumps. Here Anastasia is having her coat brushed by her trainer – and loving it! Paws & Think would not only like to thank the Nina Mason Pulliam Charitable Trust for their generous grant, but also several people who have made the Youth Canine Program possible. Superintendent at Marion Superior Court Juvenile Detention Center and Paws & Think volunteer, Charles Parkins; Paws & Think trainer, Jodi Van Slyke; and Deputy Chief of Kennel Operations at Animal Care and Control, Amanda Dehoney. With their support and the help of the grant, the Youth Canine Program will continue through the fall of 2015.